Rigid Bits attended the Trusted Choice Independent Insurance Agents of Texas conference this week in Waco Texas. The conference was aimed at helping insurance agents grow their business and better support their customers. 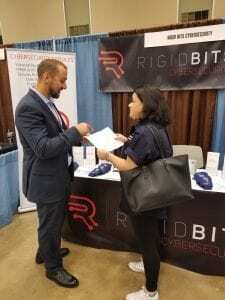 Rigid Bits exhibited at the conference and met with business owners who clearly had Cybersecurity on their minds. We discussed Cybersecurity risk, areas of concern, and solutions for agents and their customers. Consequently, we received a lot of great questions and feedback from our discussions. The event was a huge success! Through our discussions, we helped these owners by bringing awareness to areas of cybersecurity risk that could potentially have a negative impact on their business. To help agents attending the conference, we ran free scans of the Dark Web. Our Dark Web monitoring service identifies websites where hackers sell stolen email addresses and passwords. Many of our scans produced positive results, indicating a significant number of credentials were currently for sale. As a result, we demonstrated the importance of continually monitoring accounts and how password reuse may increase the likelihood of an attack. Rigid Bits had a significant amount of interest in helping agencies better educate their employees on Cybersecurity issues. Our team introduced these owners to KnowBe4, a service to help train, test, and educate employees using real like cybersecurity examples. We explained how sending simulated phishing emails can be used to track employee behavior as well as progress in identifying and avoiding phishing mistakes. My employees receive many phishing emails, how can I make sure they are not clicking on bad links? A third party hosts my data, am I still responsible for protecting it? We have an IT provider that has anti-virus and firewall turned on for us, what else would we need to do? What should I do if I think I have a breach? How can I find out if I’ve been hacked? Reach out to info@rigidbits.com to find out how we can better assist in identifying and reducing your agency’s Cybersecurity risks. For more information on Dark Web monitoring or Security Awareness Training click here!